Young people attending the 50th International Eucharistic Congress in Dublin were today invited by the Rt Rev. Mark Davies, the Bishop of Shrewsbury, England, to make a promise to be part of the Mass every Sunday of their lives. The Bishop made his remarks in a “Youth Space” catechesis in the Irish capital on Monday 11 June 2012. He reminded his audience that the Church had gathered on Sunday from its very beginnings and continued to do so even in times of persecution. 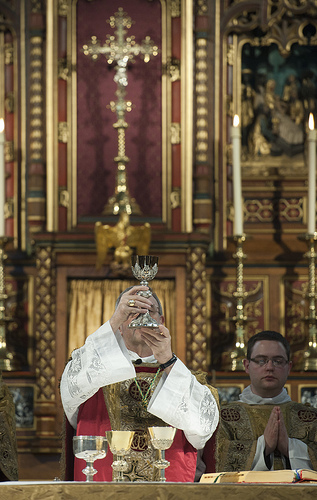 Bishop Davies said young people should not allow themselves to be put off Mass by such features as uninspiring music, a dull building or a sleepy congregation but should focus on the reality of Our Lord in the Eucharist instead. Young people should also see Sunday as the glorious day of the week, the Bishop explained, a day in which space is made for other people and one in which people can wake up to the wonder of life and to the beauty of creation. The International Eucharistic Congress, which runs from 10-17 June is expected to include as many as 80,000 participants from all over the world. The Youth Space events are able to cater for about 2,500 young people aged between 17 and 25 years. The Bishop continued: “We know for many of our ancestors getting to Mass involved risk and struggle. Indeed, our need to share in the Sacrifice and Sacrament of the Eucharist was very simply explained by St John Vianney who used to tirelessly remind those who came to church: ‘He is here, He is here, the One who loves us so much He is here!’. Pope Benedict later quoted those memorable words of Blessed John Henry Newman who lived for a time here in Dublin: “God has created me to do him some definite service. He has committed to me a task he has given to no other. I have a place in his plan”. Yet sometimes the Church gets reduced in our thinking to being just a human institution or a local community. This week invites us to glimpse the bigger reality, “the mystery of the Church” to which we all belong. For only “with the eyes of faith”, the Catechism reminds us, can we see what the Church truly is. Everyone baptised is called together into the Church which is “a sign and instrument” of our union with God and the unity of the whole of the human race, a sign pointing us and an instrument already bringing this about. Even those baptised Christians separated from us in belief and worship through the tragic divisions of history, are still closely related to this “one, holy, catholic and apostolic church” which we name in the Creed. Indeed, it is God’s plan, Christ’s own prayer that we should be “completely one” (John 17:21) so the world may believe. Today I want to invite you at this Congress, as Pope Benedict invited the youth of the world seven years ago in Cologne, to make a promise in your own hearts: a promise to be part of Sunday Mass, a promise to be part of that great gathering of the Church each Sunday wherever your young lives will lead. “Do not be deterred from taking part in Sunday Mass, and help others us to discover it too …” the Holy Father said, “Let us pledge ourselves to do this – it is worth the effort”. In many western societies Sunday has become just “the end” of a weekend rather than becoming the first day of a new week. I’m conscious too that in some parts of the world Sunday remains a busy, working day. It often demands the same heroic effort that Christians made in the first four centuries who gathered before dawn to keep the Day of the Lord and celebrate His Eucharist. I realise too that even today there are places where the faithful gather under threat of persecution or violence for simply taking part in Mass. “the people gathered in unity, beyond all their differences, the scattered children of God”. Nowadays some people take what is called a “gap year”. They travel to see the world, and to find wider horizons beyond the places where they grew up. Well, I want to suggest that the Church has a “gap day” every week of the year. It’s called Sunday, the Lord’s Day. It directs us toward the new horizons in time and eternity. The prayers of the Mass frequently speak of those wide horizons when at the Altar earth is united with Heaven, and all the saints and the angels are united with us in worship of Jesus truly present. What we come to each Sunday is a moment of recognition, when we recognise by faith, as we do this week, Christ our Lord. He is “wholly and entirely present” with us in the Eucharist. This is why for two thousand years, “the Sunday celebration of the Lord’s Day and His Eucharist is at the heart of the Church’s life”. The Youth Catechism records the voices of those martyrs back in 4th Century Africa who said: “We cannot live without Sunday.” For just as the first disciples came to that new meeting with Jesus in the first light of Easter morning, so the Church every seven days celebrates the Easter mystery. Sunday is not for us then the remembrance of a past event but “the celebration of the living presence of the Risen Lord in the midst of his people”. We “re-live the Apostles’ joyful meeting with the Risen Lord” and are able to say with Thomas the Apostle, “my Lord and my God!”. In this we know a great joy even if the music is uninspiring, the community sleepy, the building dull: it is the joy of recognising Christ in the Blessed Sacrament of the Eucharist. As Blessed John Paul II wrote, it is the same “joy experienced by the Apostles when the saw the Lord on the evening of Easter”. For the first Christians, the Lord’s Day could only be kept as a day of worship. Sunday was everywhere a working day which demanded of faithful getting up early before work to share in the Mass. Yet the Lord’s Day is also meant to become “a day of rest” for us. This rest does not mean catching up with sleep, in fact, quite the opposite. It means waking up to the wonder of life, to the beauty of creation and to its purpose. For the Jewish people the “Sabbath” called people to enter into God’s own resting on the seventh day when as the Book of Genesis tells us, “God saw all that he had made and indeed it was very good”. Sunday invites you and me to look at the world with new eyes, stepping back from the rush to glimpse the goodness of God, to recognise the beauty of creation, and to be attentive to the needs of the poorest. This is something which has always been part of the Christian Sunday. Sunday invites us to have time, to find time for family and friends, to make a space for others amid the frenetic pace of life. I remember a bishop once saying that we never come to Mass only for ourselves; we also come to Mass for the person who is there beside us, whoever they happen to be. This is expressed when before Holy Communion we offer each other the sign of peace. We extend our hand to the person standing next to us whether we know them or whether they are a complete stranger. Sunday allows us to recognise who is our neighbour. “Do you wish to honour the body of Christ?” St John Chrysostom asked a congregation many centuries before. Then do not ignore Him outside in those who suffer. For, “He who said: ‘This is my Body’ is the same One who said … ‘whatever you did to the least of my brothers you did also to me’”. Thus placed in the light of Christ’s Word and His Eucharist, our world and our lives – no matter how many shadows there may be – are always seen in a new and different light. For “like the first witnesses to the Resurrection” Blessed John Paul II wrote, “Christians who gather each Sunday to experience and proclaim the presence of the Risen Lord are called to evangelise and bear witness in their daily lives”. This week you and I are part of this International Eucharistic Congress, this gathering of the Church. Next week and every week let us pray to the Lord that we will remain part of the Church, the gathering of the Church in the Mass each Sunday wherever we may be. The 50th International Eucharistic Congress was set up in response to the invitation from Pope Benedict XVI that the Archdiocese of Dublin would host the next International Eucharistic Congress, on behalf of the whole Irish Catholic Church. It is the second time that Dublin and Ireland has hosted the International Eucharistic Congress, with the 1932 Congress considered a major organisational success that publicly showcased Catholic faith in the newly established State. The year 2012 marks the 50th anniversary of the inauguration of the Second Vatican Council, which represented an important moment of renewal and deepening of the Church’s teaching and of her understanding of herself as the Body of Christ and the People of God. Organisers therefore decided to have a Eucharistic theme rooted in the documents of the Council. The theme approved by Pope Benedict, and drawn from Lumen Gentium 7, is: “The Eucharist: Communion with Christ and with one another”. The Diocese of Shrewsbury covers the parts of Merseyside south of the River Mersey, the southern parts of Greater Manchester, parts of Derbyshire, almost all of the county of Cheshire and all of Shropshire.